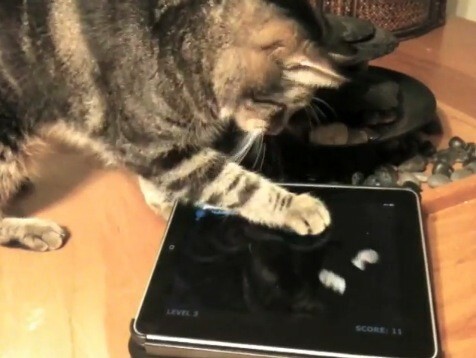 Remember the so-called “Worlds Best Video Game for Cats” for iPad that was put out by an iOS developer? Of course not, but anyway, now they have some competition from none other than Purina Friskies, who has released three free games for iPad exclusively for your furry friends. The games are basic and feature things like fish swimming around or pieces of kibble exploding into more kibble as the cat (or you, if you’re so inclined) touch the screen. Not to spoil the iPad cat party, but the games will actually run on any browser or tablet thanks to HTML5, meaning they’ll run on any iOS device and Android too. Heads up to 9to5mac for pointing me to this very important Apple-related news. And just when I thought the LinkedIn bubble IPO was the dumbest thing I’d seen all day, this comes along to take the cake. Why should humans have all the fun? Hey look, it’s the first and only use I’ve seen for an Android tablet ever! Creepy… my cat didn’t paw them as such but he was mesmerized by the moving fish and couldn’t take his eyes off it. My cat Abby loves the fish but is just insistent she can get them from UNDERNEATH the “pond” (iPad)… It actually works sometimes! The others are satisfied just to watch or smack their mouths on the screen/fish. Greatly entertaining for me at least!